A few months ago at the Historical Society of Michigan’s Local History Conference, I purchased a Flip-Pal mobile scanner from my good friend and fellow genealogist Karen Krugman. As a Flip-Pal independent reseller, she’d earlier given me a demonstration when she came to research at the Library of Michigan, and had also written about and talked up the portable and versatile scanner. Like any child on Christmas morning, I held the device in my hands, excited about the possibilities. Visions of grandeur danced through my head, scanning this, scanning that, transforming my entire collection of genealogical images and documents into a digital paradise in a matter of days. Well….as it often does, life got in the way. Fast forward to a few weeks ago – the kids were asleep early and I’m suddenly left with an open evening (!). What’s a genealogist to do? I pulled out the Flip-Pal and finally got to work. My first target was an old photo album from Leona Hansen, my great-grandmother. Born in Chicago in March 1897, she married Fenton Harvey Russell in October 1918, and died in Michigan City, Indiana in February 1981. Leona’s photo album contains hundreds of images, all taken roughly between 1916-1918, most of them in or around Chicago. As with many scrapbooks and albums from that era, the photographs were pasted or taped to the black construction paper pages; as the years have passed, the strength of the pages has deteriorated, leaving many frayed corners, separated pages, and loose pictures. As a result, I’d been reluctant to further stress the album’s binding and pages, yet still wanted to transfer the album into a digital format using affordable technology. Enter the Flip-Pal. Removing the scanner lid, I laid the scanner face down on each page and, with minimal pressure, quickly scanned the album in its entirety. Although the scanner bed is a fair size, it did take several scans to capture each page from the album. With the scanning completed, the fun really begins: stitching together multiple scans. After selecting which images to piece together, the software does all the work and in just a few moments presents a new image, digitally re-creating the album’s page in its entirety. Easy! Here is one example from the album, where three separate scans were stitched seamlessly together. Page from Leona Hansen photo album, c. 1916-1918. 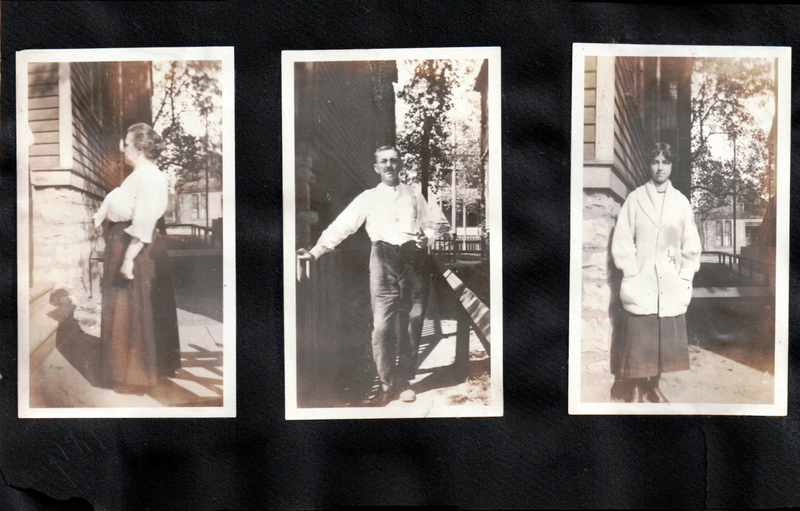 Here we have Rose Hansen on the left, her husband Sophus in the middle, and finally, Leona herself on the right. If you can make it out on the bottom left hand corner, the penciled-in date reads August 1917. Leona is therefore 20 years old, about one year before her marriage to Fenton Russell. Battery powered, easy-to-use, portable, and affordable, a combination that can’t be beat. With this first album scanned and stitched, I can’t wait to get started on the rest of my collection!